Sunday, December 7, 2014 at 3:00 p.m.
A delicious treat for the ears, the soul and the taste buds. 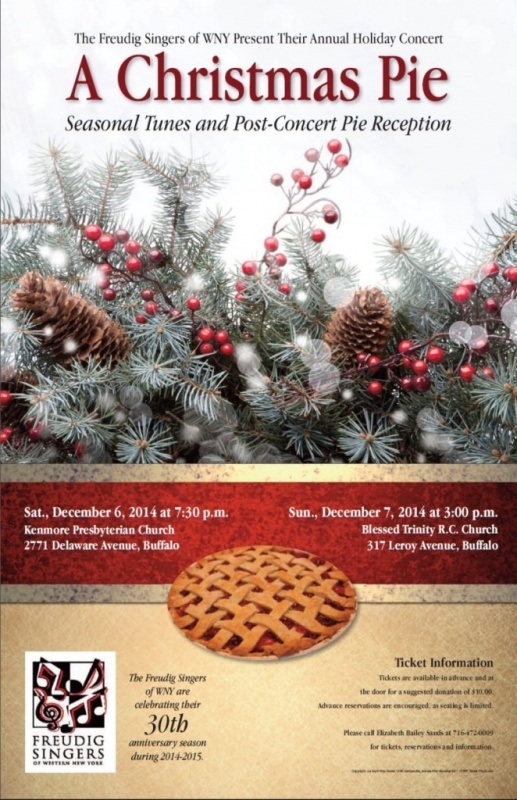 The Freudig Singers of Western New York present “A Christmas Pie,” a delectable concert of traditional and contemporary seasonal favorites. Under the direction of award-winning organist/choral composer and arranger Roland E. Martin, the Freudig Singers are celebrating their 30th anniversary. Their “Christmas Pie” concerts are a highly-anticipated holiday tradition, and this year’s offering is no exception. The choral menu includes such standards as G.R.Woodward’s arrangement of “Ding-dong-ding,” Leroy Anderson’s “Sleigh Ride,” and Jay Livingston/Ray Evans’ “Silver Bells.” Also included on the program are more recent works: Sidney King’s “Gabriel’s Message,” Martin Wimmer’s “All is Quiet, All are Sleeping,” and the stunning “Night of Dreams” by Valerie Showers Crescenz. The singers will also perform a piece composed especially for the occasion by Louisville-based musician King, who has dedicated his newest composition, “Gifts for a King,” to the Freudig Singers. The concert concludes with a fresh-baked-pie reception for audience members, including an auction of signature pies prepared by each of the singers. Tickets are $10.00 each in advance and at the door. For individual tickets, group sales and further information, please call Elizabeth Bailey Sands at (716) 551-6870.